Engine Size	1.6 liters / 98 cu. in. Wheelbase / Length	104.3 in. / 167.3 in. Curb Weight	est 2900 lbs. PERFORMANCE: Add 63 horsepower and 72 lb-ft of torque with the turbo and consider the regular Veloster completes the vision of this creative design. Here, a twin-scroll turbo gives most of the advantages of twin turbos on a four-cylinder engine with less weight and complexity. 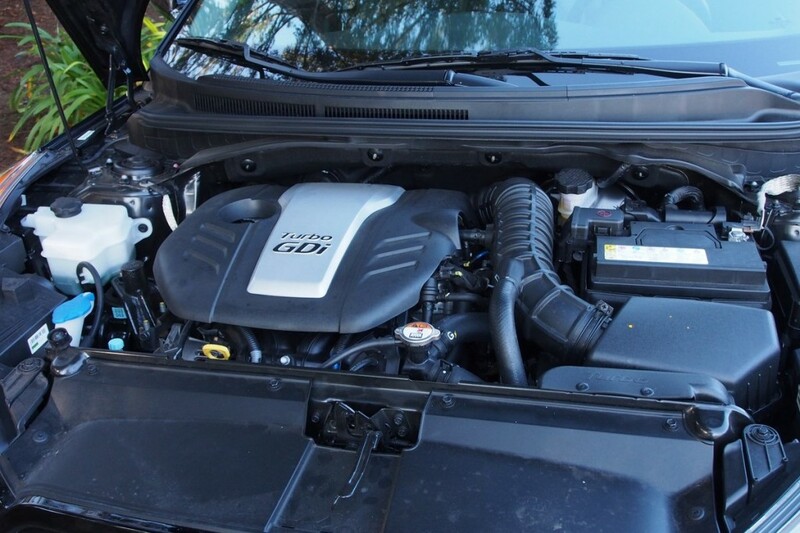 An intercooler keeps the intake charge denser, improving efficiency and power. A motor-driven electric waste gate allows precise boost control. Direct fuel injection allows a higher compression ratio than otherwise without ill effects — and this high specific output (125.6 bhp/liter) turbo engine makes its power on unleaded regular, not premium, gasoline. Maximum horsepower is 201, at 6000 rpm. That takes care of the top end. At the bottom, maximum torque is 195 lb-ft, at a low 1750 rpm. For best performance, though, keep revs above 3000. No lag at all then. There’s no real need to go above 6000, as there is plenty of urge in that wide sweet spot. Good shift linkage and well-chosen gear ratios add to the pleasure factor. 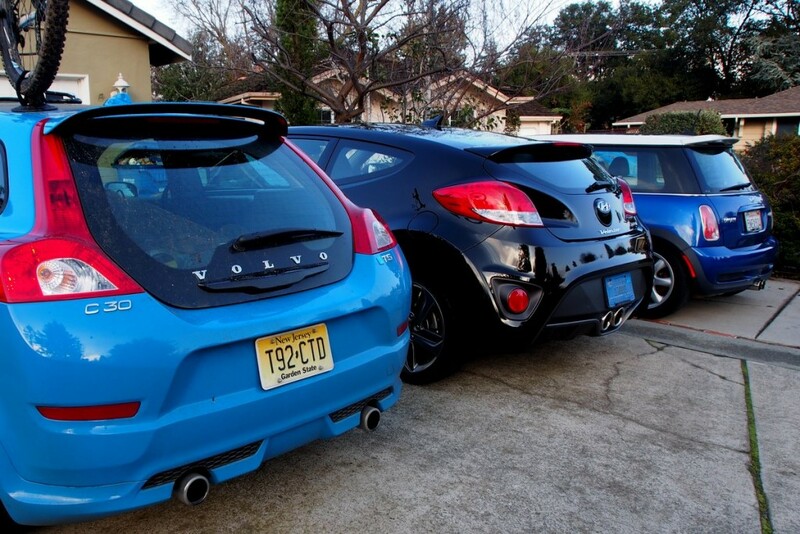 RIDE AND HANDLING: Perhaps surprisingly, the Turbo’s suspension is identical to that of the regular Veloster. With independent MacPherson struts in front and a torsion beam axle in the rear, it’s tuned moderately firmly, for a good real-world balance of comfort and cornering power. Response is improved by a quicker steering ratio. The ride can be a bit choppy on poor surfaces. So when pushed to the limit on twisty mountain roads, this is not quite as refined or as pleasurable as the new Mini Cooper Turbo or the Volvo C30. Turn-in is not great either as the car tends to oversteer. But it does remain flat through the corners and it can get uphill quite fast.. And when it comes time to squeeze into a tight parking space or garage, the Veloster will fit with ease. Other than that shortfall, the Veloster is an ingenious package, with a third door on the passenger side that allows 2 adults to clamber into the surprisingly roomy rear seat. 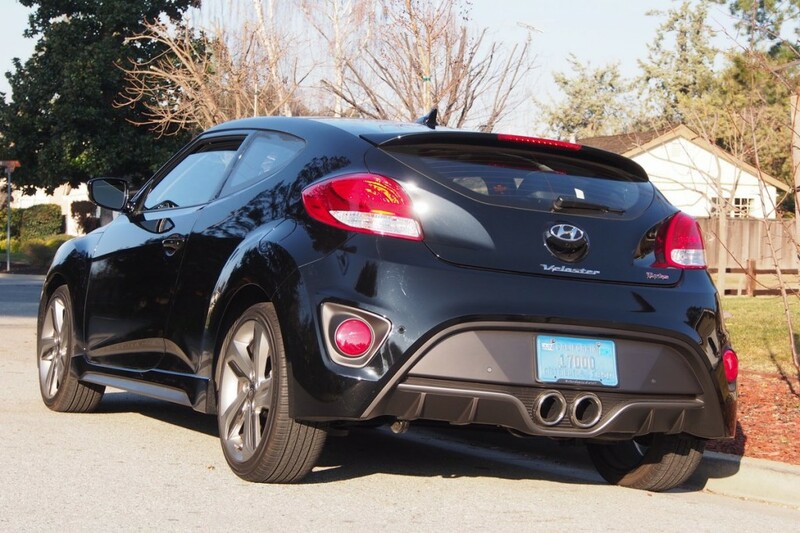 Mazda developed their RX-8 along similar lines, but unlike the RX-8’s tomb-like and airless back seat, the Veloster is designed to accommodate real people. If you intend to carry passengers in the back seat, be sure to order your Veloster with the $2,000 optional “Style Package,” which includes a “Panoramic Sunroof” that extends from the windshield header all the way back to the rear seats. This giant greenhouse really opens up what would otherwise be a claustrophobic interior. In addition, back seaters get to enjoy lounge slouch seating, and an extended upper rear window that sheds even more light on their seating position. In addition to the extended sunroof, the Style Package also includes 18 alloy wheels shod with surprisingly sticky Kumho Solus KH25 mud and snow rated tires measuring 215/40R18 front and rear. 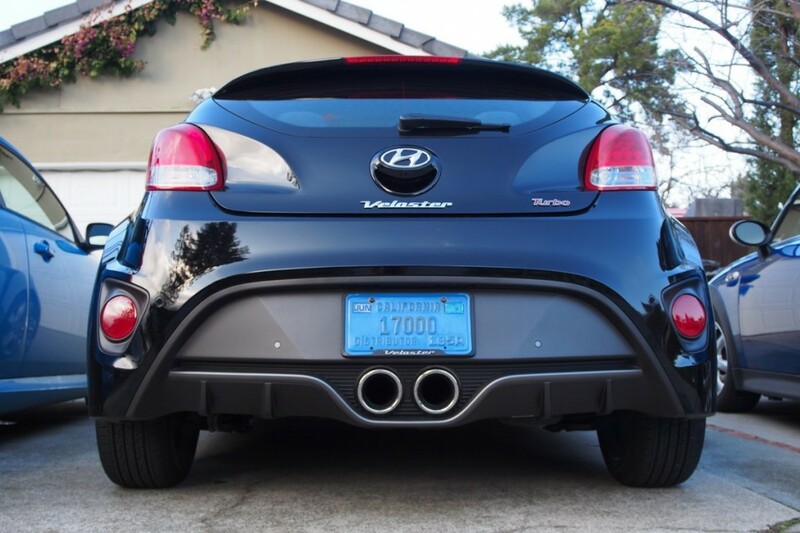 These Kumhos enhance the agile Veloster’s nimble handling. If you want to dress up the exterior appearance of the alloy wheels, you can spend another $2,000 to purchase the “Tech Package” upgrade, which adds startling body color inserts to the 5 spokes of each alloy wheel. The Tech package also includes backup warning sensors, a 7 inch Navigation screen complete with rearview camera, and keyless entry and starting. 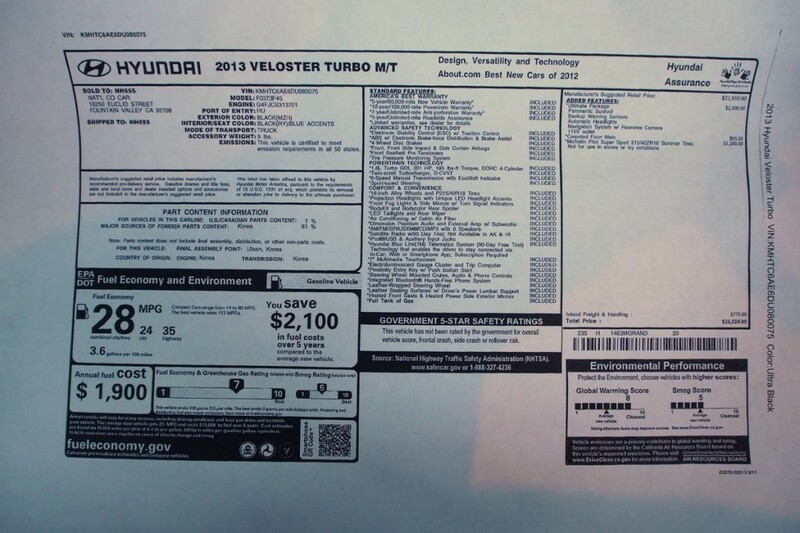 Even with all the bells and whistles the Veloster, base priced at $17,300, carried a bottom line of just $21,300. Up front, the sports seats are superb. They fit your body’s contours so closely that you’d swear they were molded individually to your form. The door panels feature oversize grab handles that make closure a pleasure rather than a chore. The entire dash is laid out with the same kind of felicitous practicality, from the thickened grab surfaces at 10 and 2 o’clock on the steering wheel, to the large central HVAC knob that takes care of everything you need for climate control. 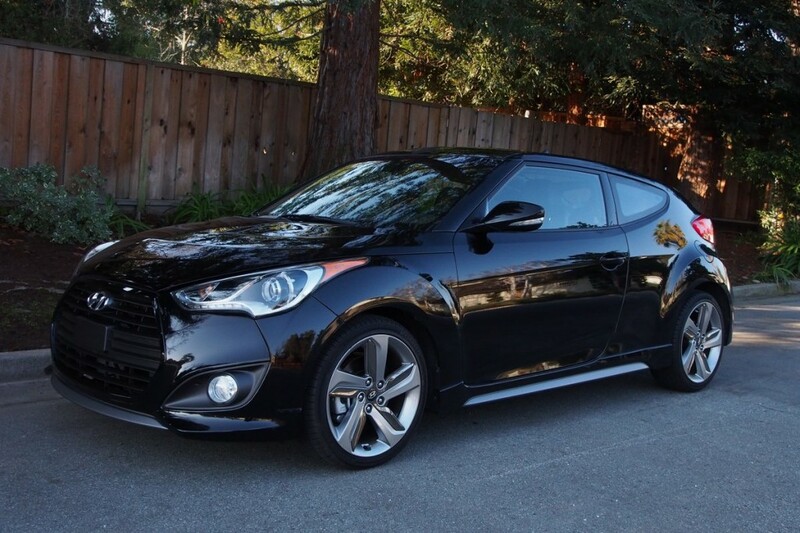 The Veloster represents a delightful departure from the norm in terms of appearance, design and usefulness. From the outside, its stunningly different architecture makes heads swivel, especially if you fit those alloys with body color spokes. From the inside, the sensible approach to passenger and space packaging makes you wonder why no one’s done this third door trick as successfully as Hyundai has here. If the lethargic performance of the present drivetrain is a stumbling block to purchase, be advised that a turbo motor is on the way, but still a year off. But if looking fast is more important to you than actually going fast, beat it down to your Hyundai dealer right now, because there’s already a lot to like here.